Resveratrol (3,5,4′-trihydroxystilbene) is a polyphenolic phytoalexin. 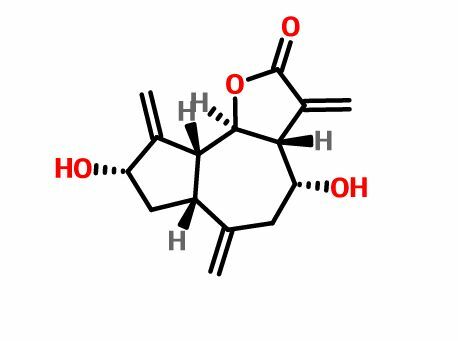 It is a stilbenoid, a derivate of stilbene, and is produced in plants with the help of the enzyme stilbene synthase. Resveratrol exists as two geometric isomers: “cis-” (“Z”) and “trans-” (“E”). The ”trans-” form can undergo isomerisation to the “cis-” form when exposed to ultraviolet irradiation. 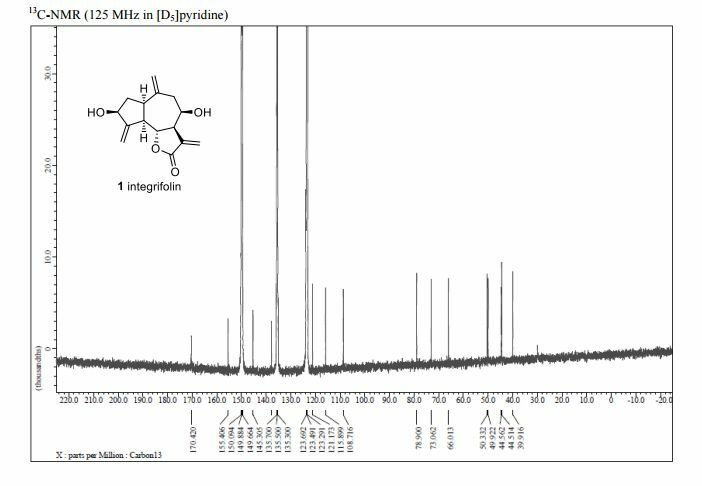 Trans-resveratrol in the powder form was found to be stable under “accelerated stability” conditions of 75% humidity and 40 degrees C in the presence of air. Resveratrol content also stayed stable in the skins of grapes and pomace taken after fermentation and stored for a long period. Numerous studies have been conducted regarding various purported resveratrol benefits. Studies have primarily been conducted on laboratory animals, and while human search is very promising, is still in its earliest stages. Current research into resveratrol benefits points to resveratrol having amazing anti-aging properties, hence dubbed “The Fountain of Youth.” Many other key benefits such as cardiovascular effects, anti-cancer, estrogen regulating effects are mentioned here. The study by Harvard Medical School researchers shows that resveratrol stimulates production of SIRT1, a serum that blocks diseases by speeding up the cell’s energy production centers known as mitochondria. Resveratrol affects the activity of enzymes called sirtuins. Sirtuins control several biological pathways and are known to be involved in the aging process. Resveratrol is only one of many natural and synthetic sirtuin-activating compounds (STACs) now known. Certain metabolic diseases, including type 2 diabetes and heart disease, tend to strike as we age. In animal studies, severely restricting calories can help prevent some of these diseases. Over a decade ago, researchers found that resveratrol can mimic calorie restriction in some ways and extend the lifespans of yeast, worms, flies and fish. Resveratrol is famous for its Cardioprotective effects.According to Wikipedia, moderate drinking of red wine has long been known to reduce the risk of heart disease. This is best known as “the French paradox”. Studies suggest resveratrol in red wine may play an important role in this phenomenon. It achieves the effects by the following functions: (1) inhibition of vascular cell adhesion molecule expression;(2) inhibition of vascular smooth muscle cell proliferation;(3) stimulation of endolethelial nitric oxide synthase (eNOS) activity;(4) inhibition of platelet aggregation;and (5) inhibition of LDL peroxidation. 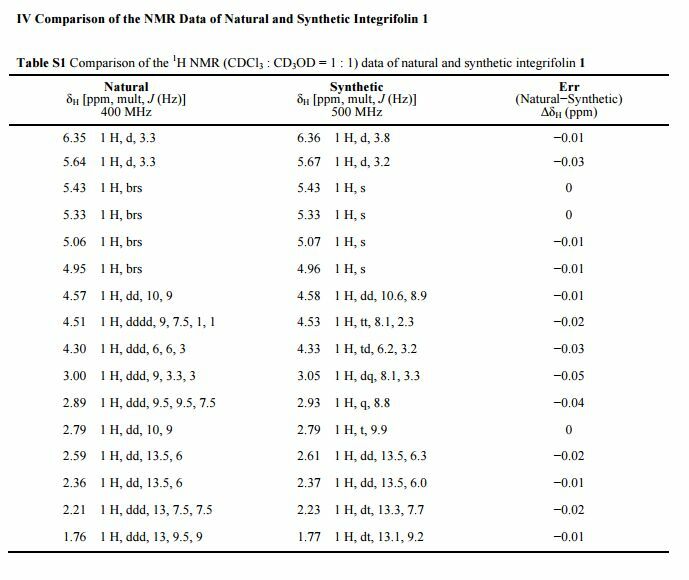 Resveratrol, a polyphenol in red wine, induces nitric oxide (NO) synthase, the enzyme responsible for the biosynthesis of NO, in cultured pulmonary artery endothelial cells, suggesting that Resveratrol could afford cardioprotection by affecting the expression of nitric oxide synthase. Experts already claim it can help you beat cancer – from brain tumours to breast, colon, prostate cancers and many more. Resveratrol is being studied to see how it affects the initiation, promotion, and progression of cancer. 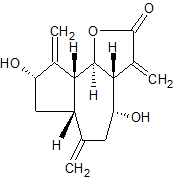 With regard to tumor initiation, it has been shown to act as an antioxidant by inhibiting free radical formation and as an anti-mutagen in rat models. Studies related to progression have found that resveratrol induced human promyelocytic leukemia cell differentiation, inhibited enzymes that promote tumor growth, and exerted antitumor effects in neuroblastomas. Noting that in animal studies, resveratrol was effective against tumors of the skin, breast, gastrointestinal tract, lung, and prostate gland. Memorial Sloan-Kettering, the American pillar of cancer treatment, conducted research on theinflammatory effects on cells leading to cancer. It is widely known that an enzyme, COX-2, lies behind the stimulation of localised hormones (eicosanoids) causing inflammation, the precursor to cancer. In the research Resveratrol completely turned off the COX-2 driver. MD Anderson´s studies have shown this same anti-inflammatory benefit too. 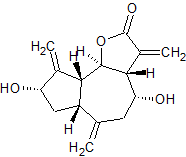 Plus, after conversion in the liver to a sulphated form the compound can attack several of the steps in the cancer process even killing cancer cells. Resveratrol is actually a very popular nutrient that has been shown on Dr. Oz, Oprah, Barbara Walters, and a number of other national television shows. It is quickly becoming one of the country’s best natural supplements. How does Resveratrol help you lose weight? Resveratrol on its own will not be effective at helping you to lose weight, but you have to use it in conjunction with exercise and a proper diet if you really want to obtain the maximum benefits from the supplement. However, the vitamin, when in concentrated form, has been proven to help speed up the metabolism. This speeding up of the metabolism causes the body to metabolize and process to food consumed faster, which causes the calories in the food to be used more effectively. When the body metabolizes food faster, there is less risk of excess calories being stored in the body in the form of fat. However, in order to ensure that Resveratrol actually works, you need to take sufficient amounts of the vitamin. The supplement is effective because it is a concentrated form of the helpful vitamin, and taking the supplement is the best way to ensure that Resveratrol works effectively in helping you shed those excess pounds. Another way Resveratrol helps you to lose weight is through reducing the amounts of estrogen that your body produces. Estrogen increases body fat and decreases muscle mass, so reducing the amounts of estrogen produced by your body will help you lose weight and build muscle. Taking Resveratrol can be a good way to ensure that your body doesn’t produce the amounts of estrogen that will keep it from building muscle. Because there have been very few studies conducted on resveratrol in humans, doctors still can’t confirm what adverse effects these supplements might have on people over the long term. So far, studies have not discovered any severe side effects, even when resveratrol is taken in large doses. However, resveratrol supplements might interact with blood thinners such as warfarin (Coumadin), and nonsteroidal anti-inflammatory medications such as aspirin and ibuprofen, increasing the risk for bleeding. Like other supplements, resveratrol isn’t regulated by the FDA, so it’s difficult for consumers to know exactly what they’re getting when they buy a bottle, or whether the product is actually effective. There also isn’t any specific dosage recommendation, and dosages can vary from supplement to supplement. The dosages in most resveratrol supplements are typically far lower than the amounts that have been shown beneficial in research studies. Most supplements contain 250 to 500 milligrams of resveratrol. To get the equivalent dose used in some animal studies, people would have to consume 2 grams of resveratrol (2,000 milligrams) or more a day. Fallopia japonica, commonly known as Japanese knotweed, is a large, herbaceous perennial plant of the family Polygonaceae, native toEastern Asia in Japan, China and Korea. In North America and Europe the species is very successful and has been classified as aninvasive species in several countries. Japanese knotweed has hollow stems with distinct raised nodes that give it the appearance ofbamboo, though it is not closely related. While stems may reach a maximum height of 3–4 m each growing season, it is typical to see much smaller plants in places where they sprout through cracks in the pavement or are repeatedly cut down. The leaves are broad oval with a truncated base, 7–14 cm long and 5–12 cm broad, with an entire margin. The flowers are small, cream or white, produced in erectracemes 6–15 cm long in late summer and early autumn. 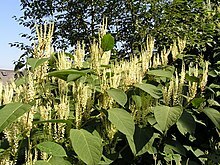 Other English names for Japanese knotweed include fleeceflower, Himalayan fleece vine, monkeyweed, monkey fungus, Hancock’s curse, elephant ears, pea shooters, donkey rhubarb (although it is not a rhubarb), sally rhubarb, Japanese bamboo, American bamboo, and Mexican bamboo (though it is not a bamboo). In Chinese medicine, it is known as Huzhang (Chinese: 虎杖; pinyin: Hǔzhàng), which translates to “tiger stick.” There are also regional names, and it is sometimes confused with sorrel. In Japanese, the name is itadori (虎杖, イタドリ?). The plant is also resilient to cutting, vigorously resprouting from the roots. The most effective method of control is by herbicideapplication close to the flowering stage in late summer or autumn. In some cases it is possible to eradicate Japanese knotweed in one growing season using only herbicides. Trials in the Queen Charlotte Islands (Haida Gwaii) of British Columbia using sea water sprayed on the foliage have demonstrated promising results, which may prove to be a viable option for eradication where concerns over herbicide application are too great. Two biological pest control agents that show promise in the control of the plant are the psyllid Aphalara itadori and a leaf spotfungus from genus Mycosphaerella. It is classed as an unwanted organism in New Zealand and is established in some parts of the country. In the UK, Japanese Knotweed is established in the wild in many parts of the country and creates problems due to the impact on biodiversity, flooding management and damage to property. 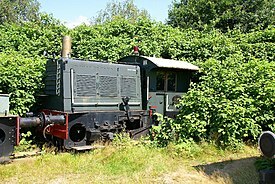 It is an offence under section 14(2) of the Wildlife and Countryside Act 1981 to “plant or otherwise cause to grow in the wild” any plant listed in Schedule nine, Part II to the Act, which includes Japanese knotweed. It is also classed as “controlled waste” in Britain under part 2 of the Environmental Protection Act 1990. This requires disposal at licensed landfill sites. The species is expensive to remove; Defra‘s Review of Non-native Species Policy states that a national eradication programme would be prohibitively expensive at £1.56 billion. The decision was taken on 9 March 2010 in the UK to release into the wild a Japanese psyllid insect, Aphalara itadori. Its diet is highly specific to Japanese knotweed and shows good potential for its control. The weed can be found in 39 of the 50 United States and in six provinces in Canada. It is listed as an invasive weed in Maine,Ohio, Vermont, Virginia, West Virginia, New York, Alaska, Pennsylvania, Michigan, Oregon and Washington state. Similarly to rhubarb, knotweed contains oxalic acid, which when eaten may aggravate conditions such as rheumatism, arthritis, gout, kidney stones or hyperacidity. Both Japanese knotweed and giant knotweed are important concentrated sources of resveratrol and its glucoside piceid, replacing grape byproducts. 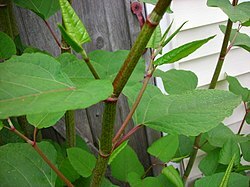 Many large supplement sources of resveratrol now use Japanese knotweed and use its scientific name in the supplement labels. The plant is useful because of its year-round growth and robustness in different climates. Japanese knotweed has a large underground network of roots (rhizomes). To eradicate the plant the roots need to be killed. All above-ground portions of the plant need to be controlled repeatedly for several years in order to weaken and kill the entire patch. Picking the right herbicide is essential, as it must travel through the plant and into the root system below. Glyphosate is the best active ingredient in herbicide for use on Japanese knotweed as it is ’systemic’; it penetrates through the whole plant and travels to the roots. Digging up the rhizomes is a common solution where the land is to be developed, as this is quicker than the use of herbicides, but safe disposal of the plant material without spreading it is difficult; knotweed is classed as controlled waste in the UK, and disposal is regulated by law.Digging up the roots is also very labor-intensive and not always efficient. The roots can go to up to 10 feet (3 meters) deep, and leaving only a few inches of root behind will result in the plant quickly growing back. More ecologically-friendly means are being tested as an alternative to chemical treatments. Soil steam sterilization  involves injecting steam into contaminated soil in order to kill subterranean plant parts. Research has also been carried out on Mycosphaerella leafspot fungus, which devastates knotweed in its native Japan. This research has been relatively slow due to the complex life cycle of the fungus. Research has been carried out by not-for-profit inter-governmental organisation CABI in the UK. Following earlier studies imported Japanese knotweed psyllid insects (Aphalara itadori), whose only food source is Japanese knotweed, were released at a number of sites in Britain in a study running from 1 April 2010 to 31 March 2014. In 2012, results suggested that establishment and population growth were likely, after the insects overwintered successfully. In response to this guidance, several lenders have relaxed their criteria in relation to discovery of the plant. As recently as 2012, the policy at the Woolwich (part of Barclays plc) was “if Japanese Knotweed is found on or near the property then a case will be declined due to the invasive nature of the plant.” Their criteria have since been relaxed to a category-based system depending on whether the plant is discovered on a neighbouring property (categories 1 and 2) or the property itself (categories 3 and 4) incorporating proximity to the property curtilage and the main buildings. Even in a worst-case scenario (category 4), where the plant is “within 7 metres of the main building, habitable spaces, conservatory and/or garage and any permanent outbuilding, either within the curtilage of the property or on neighbouring land; and/or is causing serious damage to permanent outbuildings, associated structures, drains, paths, boundary walls and fences” Woolwich lending criteria now specify that this property may be acceptable if “remedial treatment by a Property Care Association (PCA) registered firm has been satisfactorily completed. Treatment must be covered by a minimum 10-year insurance-backed guarantee, which is property specific and transferable to subsequent owners and any mortgagee in possession.”  Santander have relaxed their attitude in a similar fashion (citation needed). The plant is known as itadori (イタドリ, 虎杖?). The kanji expression is from the Chinese meaning “tiger staff”, but as to the Japanese appellation, one straightforward interpretation is that it comes from “remove pain” (alluding to its painkilling use), though there are other etymological explanations offered. It grows widely throughout Japan and is foraged as a wild edible vegetable (sansai), though not in sufficient quantities to be included in statistics. They are called by such regional names as: tonkiba (Yamagata), itazuiko (Nagano, Mie), itazura (Gifu, Toyama, Nara, Wakayama, Kagawa), gonpachi (Shizuoka, Nara, Mie, Wakayama),sashi (Akita, Yamagata), jajappo (Shimane, Tottori, Okayama), sukanpo (many areas). Places in Shikoku such as central parts of Kagawa Prefecture  pickle the peeled young shoots by weighting them down in salt mixed with 10% nigari (magnesium chloride).Kochi also rub these cleaned shoots with coarse salt-nigari blend. It is said (though no authority is cited) that the magnesium of the nigari binds with the oxalic acid thus mitigating its hazard. A novel use for a related species known as oh-itadori (Polygonum sachalinense) in Hokkaido is feeding it to larvae of sea urchins in aquaculture. Jump up^ RHS. “RHS on Japanese Knotweed”. RHS. Retrieved 6 June 2014. Jump up^ “itadori”. Denshi Jisho — Online Japanese dictionary. Retrieved 9 March 2010. Jump up^ Synergy International Limited <http://www.synergy.co.nz> (2004-01-30). “IUCN Global Invasive Species Database”. Issg.org. Retrieved 2014-06-30. Jump up^ “Article on the costs of Japanese Knotweed”. Gardenroots.co.uk. Retrieved 2014-06-30. Jump up^ Matthew Chatfield (2010-03-14). “”Tell me, sweet little lice” Naturenet article on psyllid control of knotweed”. Naturenet.net. Retrieved 2014-06-30. Jump up^ Morelle, R. Alien invaders hit the UK. BBC News October 13, 2008. Jump up^ “Asiatic knotweed”. Biosecurity New Zealand. 14 January 2010. Retrieved 29 December 2012. Jump up^ “Review of non-native species policy”. Defra. Retrieved 14 July 2013. Jump up^ Morelle, Rebecca (2010-03-09). “BBC News”. BBC News. Retrieved 2014-06-30. Jump up^ Richard H. Shaw, Sarah Bryner and Rob Tanner. “The life history and host range of the Japanese knotweed psyllid, Aphalara itadori Shinji: Potentially the first classical biological weed control agent for the European Union”. UK Biological Control. Volume 49, Issue 2, May 2009, Pages 105-113. Jump up^ “CABI Natural control of Japanese knotweed”. Cabi.org. Retrieved 2014-06-30. Jump up^ National Invasive Species Information Center. 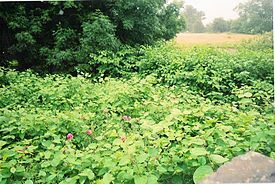 “USDA weed profile for Japanese knotweed”. Invasivespeciesinfo.gov. Retrieved 2014-06-30. Jump up^ “Pilot project of Bionic Knotweed Control in Wiesbaden, Germany”. Newtritionink.de. Retrieved 2014-06-30. Jump up^ “Japanese Knotweed”. Edible Plants. Retrieved 2014-06-30. Jump up^ “Notes on Biological control and Japanese knotweed”. Gardenroots.co.uk. Retrieved 2014-06-30. Jump up^ “Testing the psyllid: first field studies for biological control of knotweed United Kingdom”. CABI. Retrieved 2014-06-30. Jump up^ “On CABI Web site, Japanese Knotweed Alliance: Japanese knotweed is one of the most high profile and damaging invasive weeds in Europe and North America”. Cabi.org. Retrieved 2014-06-30. Jump up^ Leah Milner Last updated at 11:30AM, July 8, 2013 (2013-07-08). “Japanese knotweed uproots home sales”. The Times. Retrieved 2014-06-30. ^ Jump up to:a b 05 Jul 2013 (2013-07-05). “RICS targets the root of Japanese Knotweed risk to property”. Rics.org. Retrieved 2014-06-30. Jump up^ “Woolwich Lending Criteria – Property Types”. Jump up^ “Japanese knotweed, the scourge that could sink your house sale”. The Guardian. 2014-09-08. Jump up^ “Residential Lending Criteria”. Woolwich. July 2014. Jump up^ “Brokers demand action on Japanese knotweed”. Mortgagesolutions.co.uk. 2013-08-14. Retrieved 2014-06-30. Jump up^ “イタドリ”. 讃岐の食(Sanuki eating). 2001. Retrieved Apr 2012. Jump up^ “北海道食材ものがたり２１　ウニ”. 道新ＴＯＤＡＹ. Sept-1999 1999. Retrieved Apr 2012. Nigella Sativa Kills 89% of Lung Cancer Cells in Vitro: Researchers have just shown that nigella sativa (also known as black seed or black cumin) seed oil killsup to 89% of human lung cancer cells (A-549) after just 24 hours, while a non-oil extract from the seeds killed up to 77% of the cancer cells. The extracts were prepared from seeds obtained at a local market. Nigella sativa is a powerful medicinal herb which has been used for thousands of years in traditional Chinese, Ayurvedic, Unani and Arabic medicine. It is best known for its potent anti-inflammatory and antioxidant properties, and has been used to suppress coughs, treat kidney stones, diarrhea and stomach pain. But modern science has now also uncovered nigella’s powerful anti-diabetes and anti-cancer effects. This super herb has already shown potent activity against cancer of the breast, prostate, kidney, pancreas, liver, colon and cervix in previous lab studies, and this new study has shown new activity against lung cancer. Good health and cancer prevention should always start with a well-balanced diet focused on organic vegetables, fruit and whole foods (consuming at least half in the raw state). But nigella sativa may offer sizeable benefits for those wanting an extra measure of protection. Nigella sativa is an annual flowering plant, native to south and southwest Asia. It grows to 20–30 cm (7.9–11.8 in) tall, with finely divided, linear (but not thread-like) leaves. The flowers are delicate, and usually coloured pale blue and white, with five to ten petals. The fruit is a large and inflated capsule composed of three to seven united follicles, each containing numerous seeds. The seed is used as a spice. The scientific name is a derivative of Latin niger (black). 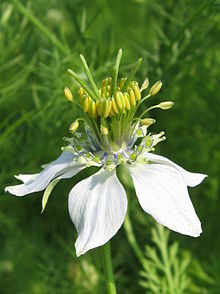 In English, Nigella sativa seed is variously called fennel flower, nutmeg flower, black caraway, Roman coriander, and also called black cumin. Other names used, sometimes misleadingly, are onion seed and black sesame, both of which are similar-looking, but unrelated.Blackseed and black caraway may also refer to Bunium persicum. The seeds are frequently referred to as black cumin (as in Assamese: kaljeera or kolajeera or Bengali kalo jeeray), But black cumin (kala Jeera)[clarification needed] is different than Nigella sativa (Kali Jeeri). In south Indian language Kannada it is called [ಕೃಷ್ಣ ಜೀರಿಗೆ] “Krishna Jeerige”, but this is also used for a different spice, Bunium persicum. In English-speaking countries with large immigrant populations, it is also variously known as kaljeera (Assamese কালজীৰা kalzira or ক’লাজীৰাkolazira), kalo jira (Bengali: কালোজিরা kalojira, black cumin), karum cheerakam, habbat al-barakah (Arabic حبة البركة) Kurdish “reşke” (rashkeh) (Tamil கருஞ்சீரகம்), kalonji (Hindi कलौंजी kalauṃjī or कलोंजी kaloṃjī, Urdu كلونجى kaloṃjī) or mangrail (Hindi मंगरैल maṃgarail), “Kala Jira in Marathi” ketzakh (Hebrew קצח), chernushka (Russian), çörek otu (Turkish), garacocco (Cypriot Turkish), ḥebbit al-barakah, seed of blessing (Arabic), siyah daneh (Persian سیاه‌دانه siyâh dâne), jintan hitam (Indonesian), karim jeerakam (കരിംജീരകം) in Malayalamor කළු දුරු in Sinhala, Karto Jeera in Beary. It is used as part of the spice mixture paanch phoran or panch phoron (meaning a mixture of five spices) and by itself in a great many recipes in Bengali cookery and most recognizably in naan bread. The Turkish name çörek otu literally means “bun’s herb” from its use in flavouring the çörek buns. Such braided-dough buns are widespread in the cuisines of Turkey and its neighbours (see Tsoureki τσουρέκι). In Bosnian, the Turkish name for Nigella sativa is respelled as čurekot. The seed is used in Bosnia, and particularly its capital Sarajevo, to flavour pastries (Bosnian: somun) often baked on Muslim religious holidays. The Arabic approbation about Bunium bulbocastanum (Kaala Jeera) Hebbit il barakah, meaning the “seed of blessing” is also applied toNigella sativa (Kali Jeeri). Nigella sativa has a pungent bitter taste and smell. It is used primarily in confectionery and liquors. Peshawari naan is, as a rule, topped with kalonji seeds. Nigella is also used in Armenian string cheese, a braided string cheese called Majdouleh or Majdouli in the Middle East. According to Zohary and Hopf, archaeological evidence about the earliest cultivation of N. sativa “is still scanty”, but they report supposed N. sativa seeds have been found in several sites from ancient Egypt, including Tutankhamun‘s tomb. Although its exact role in Egyptian culture is unknown, it is known that items entombed with a pharaoh were carefully selected to assist him in the afterlife. The earliest written reference to N. sativa is thought to be in the book of Isaiah in the Old Testament, where the reaping of nigella and wheat is contrasted (Isaiah 28: 25, 27). Easton’s Bible dictionary states the Hebrew word ketsah refers to N. sativa without doubt (although not all translations are in agreement). According to Zohary and Hopf, N. sativawas another traditional condiment of the Old World during classical times; and its black seeds were extensively used to flavour food. Found in Hittite flask in Turkey from 2nd millennium BCE. The black cumin (Bunium bulbocastanum) seeds have been traditionally used in the Middle East and Southeast Asian countries for a variety of ailments. Nigella seeds are sold as black cumin in small bundles to be rubbed until warm, when they emit an aroma similar to black cumin which opens clogged sinuses in the way that do eucalyptus or Vicks. Nestlé has purportedly filed a patent application covering use of Nigella sativa as a food allergy treatment. 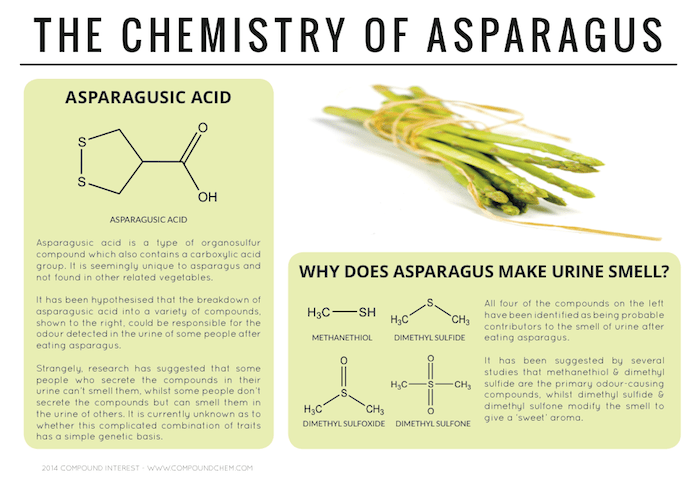 Yet the firm denies the claim of patenting the plant, stating that the patent would only cover “the specific way that thymoquinone – a compound that can be extracted from the seed of the fennel flower – interacts with opioid receptors in the body and helps to reduce allergic reactions to food”. 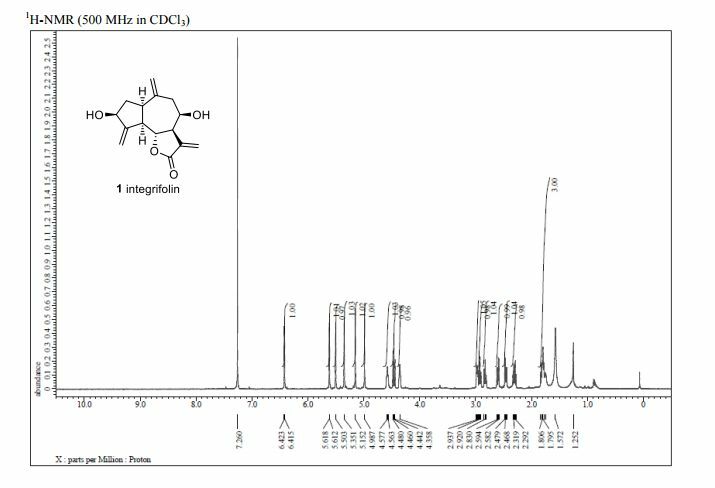 Thymoquinone, found in the seed oil extract of N. sativa, has been shown to have anti-neoplastic effects in rats and mice and in cultured human cells from several types of cancer, including pancreatic ductal adenocarcinoma. It has protective antioxidant and anti-inflammatory effects, and promotes apoptosis (cell death) of the cancer cells. Original black cumin (Bunium bulbocastanum) is rarely available, so N. sativa is widely used instead; in India, Carum carvi is the substitute. Cumins are from the Apiaceae (Umbelliferae) family, but N. sativa is from Ranunculaceae family. 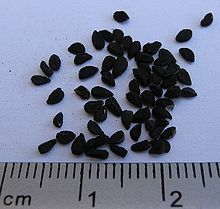 Black cumin (not N. sativa) seeds come as paired or separate carpels, and are 3–4 mm long. They have a striped pattern of nine ridges and oil canals, and are fragrant (Ayurveda says, “Kaala jaaji sugandhaa cha” (black cumin seed is fragrant itself)), blackish in colour, boat-shaped, and tapering at each extremity, with tiny stalks attached; it has been used for medicinal purposes for centuries, both as a herb and pressed into oil, in Asia, the Middle East, and Africa. Nigella sativa oil contains an abundance of conjugated linoleic (18:2) acid, thymoquinone, nigellone (dithymoquinone), melanthin, nigilline,damascenine, and tannins. Melanthin is toxic in large doses and nigelline is paralytic, so this spice must be used in moderation. “The Plant List: A Working List of All Plant Species”. Zohary, Daniel; Hopf, Maria (2000). Domestication of plants in the Old World (3 ed.). Oxford University Press. p. 206. ISBN 0-19-850356-3. “71”. Sahih Bukhari 7. 592. Hammond, Edward (2012). “Food giant Nestlé claims to have invented stomach soothing use of habbat al-barakah (Nigella sativa)”. Briefing Paper. Third World Network. Retrieved 23 April 2013. 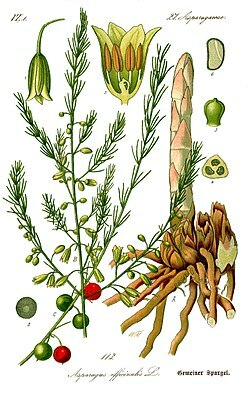 “Is Nestlé trying to patent the fennel flower?”, http://www.nestle.com. Chehl, N.; Chipitsyna, G.; Gong, Q.; Yeo, C.J. ; Arafat, H.A. (2009). “Anti-inflammatory effects of the Nigella sativa seed extract, thymoquinone, in pancreatic cancer cells”. HPB (Oxford) 11 (5): 373–381. doi:10.1111/j.1477-2574.2009.00059.x. PMID 19768141. Mohammad Hossein Boskabady, Batool Shirmohammadi (2002). “Effect of Nigella Sativa on Isolated Guinea Pig Trachea”. Arch Iranian Med 5 (2): 103–107. Ali BH, Blunden G (April 2003). “Pharmacological and toxicological properties of Nigella sativa”. 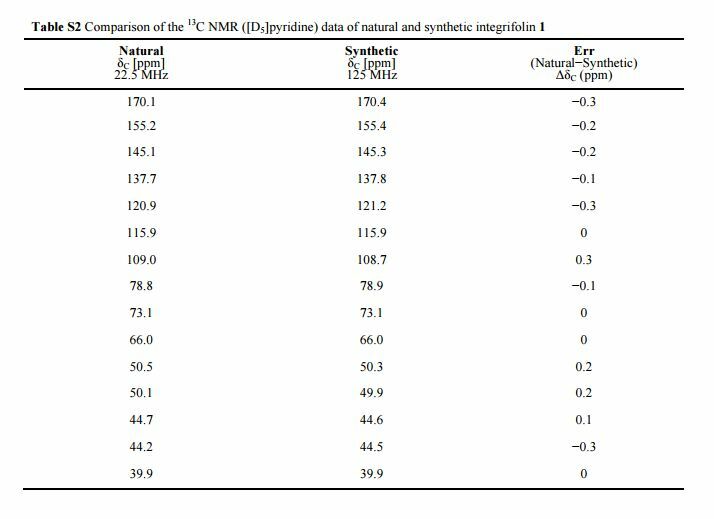 Phytother Res 17 (4): 299–305.doi:10.1002/ptr.1309. PMID 12722128. Turmeric contains up to 5% essential oils and curcumin of about three percent by weight, a polyphenol. Curcumin is the active substance of turmeric and curcumin is known as C.I. 75300, or Natural Yellow 3. 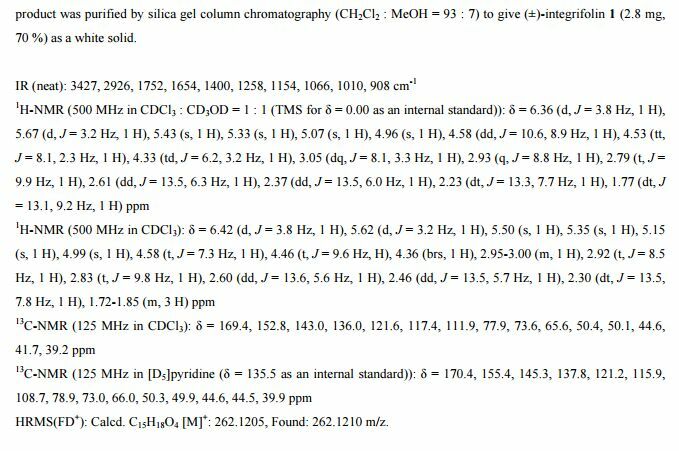 The systematic chemical name is (1E,6E)-1,7-bis(4-hydroxy-3-methoxyphenyl)-1,6-heptadiene-3,5-dione. 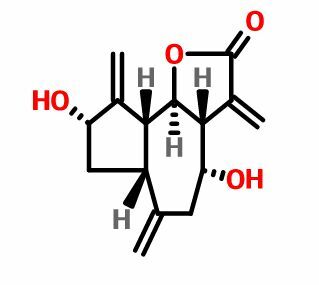 It can exist at least in two tautomeric forms, keto and enol. Curcumin is a pH indicator. In acidic solutions (pH <7.4) it turns yellow, whereas in basic (pH > 8.6) solutions it turns bright red. A compound found in the bark of an African bush may hold clues to the development of drugs for reversing a host of addictive behaviours from drug and alcohol abuse and even smoking and compulsive over-eating, scientists reported at the BIO convention in Chicago, US, in April 2013. 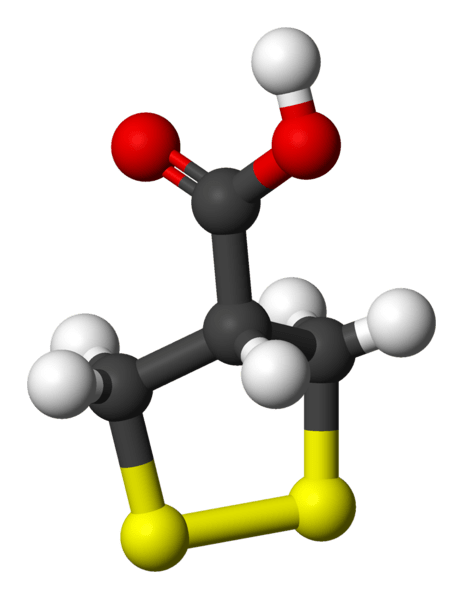 (–)-18-Methoxycoronaridine (18-MC) is a derivative of ibogaine invented in 1996 by the research team around the pharmacologist Stanley D. Glick from the Albany Medical College and the chemist Martin E. Kuehne from the University of Vermont. In animal studies it has proved to be effective at reducing self-administration of morphine, cocaine, methamphetamine, nicotine and sucrose. 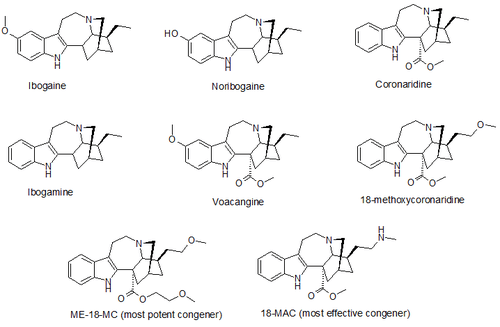 18-MC is a selective α3β4 nicotinic antagonist and, in contrast to ibogaine, has no affinity at the α4β2 subtype nor at NMDA-channels nor at the serotonin transporter, and has significantly reduced affinity for sodium channels and for the σ receptor, but retains modest affinity for the μ and κ opioid receptors. The sites of action in the brain include the medial habenula, interpeduncular nucleus, dorsolateral tegmentum and basolateral amygdala. It has also been shown to produce anorectic effects in obese rats, most likely due to the same actions on the reward system which underlie its anti-addictive effects against drug addiction. 18-MC has not yet been tested in humans. In 2002 the research team started trying to raise funds for human trials, but were unable to secure the estimated $5 million needed. Efforts to raise funds for future trials are still ongoing. 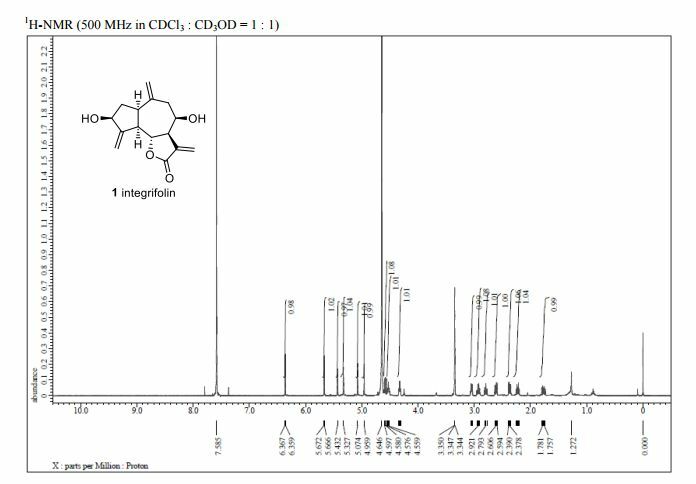 In January 2010, Obiter Research, a chemical manufacturer in Champaign, Illinois, signed a patent license with Albany Medical College and the University of Vermont allowing them the right to synthesize and market 18-MC and other congeners. February 21, 2013, Natrol, Inc., a global leader in the nutrition industry and trusted manufacturer and marketer of superior quality supplements, has raised the bar for hair technology and created an alternate and innovative method to enhance hair rejuvenation among men and women with NuHair® FOAM. The product is hitting the marketplace following Natrol’s tablet hair-rejuvenation product being named the #1 selling supplement for hair growth. NuHair® FOAM, now available at Walgreens nationwide, joins the NuHair line of dietary supplements that includes: Hair Regrowth Tablets designed for both men and women, Thinning Hair Serum, and DHT Blocker. The product was specifically created to protect against follicle damage, graying hair, and bring nourishment to the scalp and revitalize each strand to promote fuller, beautiful hair. It is also a 2-in-1 product, which has a light hold for styling. Chamomile and Sage: Revitalizes the scalp, strengthens the texture of the hair, and promotes elasticity. Fo-Ti: Supports hair growth and may help prevent thinning and graying hair. Vitamin E: Stabilizes cell membranes in hair follicles to encourage proper growth. Vitamin B5: Penetrates the hair cuticle to retain moisture, leaving strands pliable, shinier and thicker. Shea Butter: Soothes dryness from root to tip, repairs breakage and mends split ends. Rosemary: Stimulates and improves hair group and may help darken gray hair. Nettle: Revitalizes and repairs brittle and damaged hair. Grape Seed Extract: Enhances hair growth and provides a rich, silky luster. NuHair® belongs to Natrol, Inc.’s family of brands: Natrol, MRI, PROLAB, Promensil, Trinovin, Laci Le Beau, Shen Min, and Vedic Mantra. NuHair® products are also available on Amazon.com, www.bodybuilders.com and other online retailers. 08 February 2013, Organic India, a manufacturer of herb-based functional supplements, has launched organic single ingredient Moringa products in the US. Available in both capsule and powder formulations, the product made from powdered leaves of Moringa oleifera tree contains vitamin A, B1, B3, B12, iron, magnesium, potassium, amino acids, and polyphenols and is used for restoring internal imbalances. Organic India national sales manager Heather Henning said the ancient therapeutic Moringa oleifera plant has been used for years and has seen increasing popularity amongst mainstream consumers worldwide. “Millions of people globally use Moringa for essential nutrition — now, the US distribution channel will have access to this extraordinary plant with USDA organic certification,” Henning added. The company said Moringa supplement, which has more B12 than steak, more vitamin A than eggs, and more calcium than milk, will be unveiled to the public at Expo West 2013. Moringa oleifera (synonym: Moringa pterygosperma) is the most widely cultivated species of the genus Moringa, which is the only genus in the family Moringaceae. English common names include moringa, and drumstick tree, from the appearance of the long, slender, triangular seed pods, horseradish tree, from the taste of the roots which resembles horseradish, or ben oil tree, from the oil derived from the seeds. The tree itself is rather slender, with drooping branches that grow to approximately 10m in height. In cultivation, it is often cut back annually to 1–2 meters and allowed to regrow so the pods and leaves remain within arm’s reach. In developing countries, moringa has potential to improve nutrition, boost food security, foster rural development, and support sustainable landcare. It may be used as forage forlivestock, a micronutrient liquid, a natural anthelmintic and possible adjuvant. 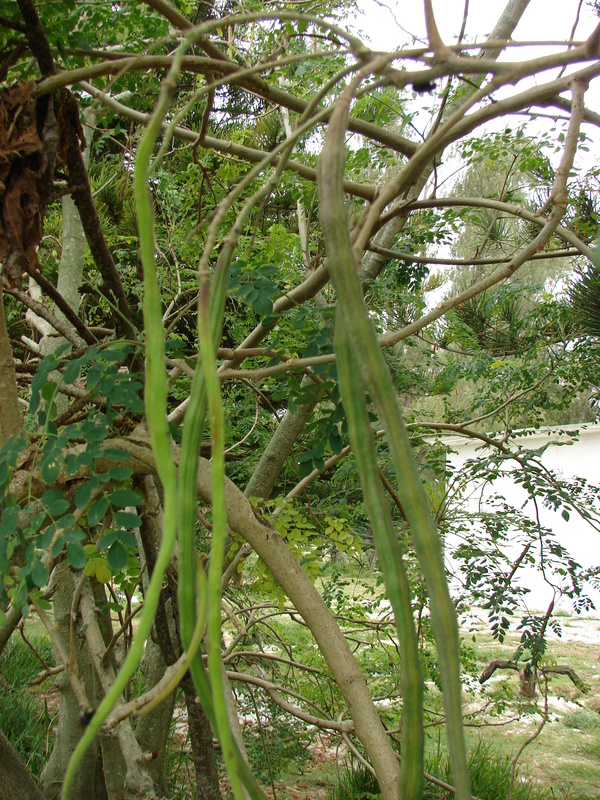 The moringa tree is grown mainly in semiarid, tropical, and subtropical areas, corresponding in the United States to USDA hardiness zones 9 and 10. While it grows best in dry, sandy soil, it tolerates poor soil, including coastal areas. It is a fast-growing, drought-resistant tree that is native to the southern foothills of the Himalayas in northwestern India. Cultivation in Hawai’i, for commercial distribution in the United States, is in its early stages. Moringa is grown in home gardens and as living fences in Tamil Nadu Southern India and Thailand, where it is commonly sold in local markets. In the Philippines, it is commonly grown for its leaves, which are used in soup. Moringa is also actively cultivated by theWorld Vegetable Center in Taiwan, a center for vegetable research with a mission to reduce poverty and malnutrition in developing countries through improved production and consumption of vegetables. Tamil Nadu Southern India has Moringa in its folk stories and as well considered to be auspicious to grow in home. Interestingly the name in Tamil is Moorungai which sounds same as Moringa. Verzosa, Caryssa. “Malunggay and Spinach Powder (Investigatory Project Sample)”. Scribd.com. Retrieved 4-11-2012. National Research Council (2006-10-27). 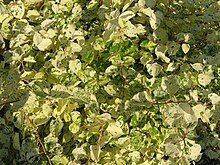 “Moringa”. Lost Crops of Africa: Volume II: Vegetables. Lost Crops of Africa. 2. National Academies Press. ISBN 978-0-309-10333-6. Retrieved 2008-07-15. Makkar HP, Francis G, Becker K (2007). 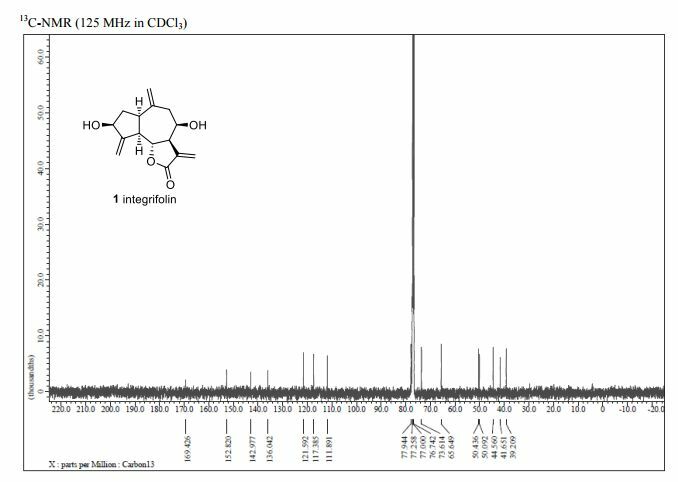 “Bioactivity of phytochemicals in some lesser-known plants and their effects and potential applications in livestock and aquaculture production systems”. Animal 1 (9): 1371–91. doi:10.1017/S1751731107000298.PMID 22444893. Ted Radovich (2010). C.R Elevitch. ed. “Farm and Forestry Production and Marketing profile for Moringa”. Specialty Crops for Pacific Island Agroforestry (Holualoa, Hawai’i: Permanent Agriculture Resources). Rajangam J., et al. (October 29 – November 2, 2001). “Status of Production and Utilisation of Moringa in Southern India”.Development potential for Moringa products (Dar es Salaam, Tanzania).